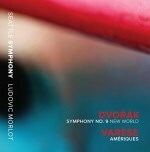 Dvořák’s New World Symphony is a repertory staple (see Masterwork Index). But the flood of new recordings of it, in the past year, is still a surprise. Seemingly every rising young conductor and orchestra has released an album featuring the piece. Here, I’ll review new releases of the Dvořák Ninth by Andris Nelsons, Robin Ticciati, Jaap van Zweden, and Ludovic Morlot, plus a brand-new release of an older recording by Karel Ančerl. When I start talking about a new album, I’ll put the conductor’s name in bold, in case you want to skip ahead to a particular release. Robin Ticciati, on the cover of his new Tudor recording with the Bamberg Symphony, adopts the same giant curly hair as Gustavo Dudamel - and, before them, Simon Rattle. His Dvořák Ninth is a performance hampered, sadly, by sub-standard sound. I adjust the volume to a satisfactory level in the introduction, only to find out that the main movement is far too quiet in comparison. A nice volume boost does not add presence to the deeply recessed timpani. That presence is given over, instead, to somebody’s deep breathing and sighing. This is a pity, because, if you can overlook the shallow sound, Ticciati and the Bamberg Symphony offer a very good account of the symphony. The horns and trombones ring out, the strings add portamenti to the lyrical second theme in the first movement and the woodwinds are especially noteworthy throughout the piece. Although the famous slow movement is faster and less lyrical than I’d like, the finale is excitingly paced and features a particularly delicate clarinet solo. The scherzo is well-played but suffers from the relative absence of the timpani, which you can’t hear at all in its important part at 4:55-5:10 (see John Whitmore's review). Jaap van Zweden has his Dallas Symphony sounding even more Old-World than Ticciati has the Bambergers. 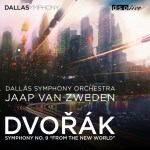 The Dallas orchestra is downright spectacular in this live recording, with rich, satisfying strings, especially, and an aggressive timpanist. I’ve listened to this recording more than the others, because I’m surprised by how good it is, and feel the need continually to reassess. No matter how many times it gets played, my respect never dwindles: not only do the players and conductor never make a mistake but they also offer more than mere competence. It’s the product of superb playing and level-headed musicianship. Ironically, maybe, given that this is a truly old-school performance, it’s only available as a digital download, from eClassical, iTunes and other online stores. The Seattle Symphony’s performance is more “new-world” in orchestral feel, but that’s not a bad thing for the New World Symphony. Ludovic Morlot’s main unique trait, as an interpreter, is his habit of keeping note-lengths short in the outer movements’ melodies. You’ll notice that, at the ends of phrases, where other conductors let the musicians linger on a note or chord, Morlot keeps things carefully-trimmed. It’s not a big change from usual but the performance is otherwise competent and well-played without being remarkable. In other words, they rank right behind van Zweden and Dallas. Everybody, though, ranks behind Andris Nelsons’ performance with the Berlin Radio Symphony. This, which we’ve previously reviewed (CD version; Blu-Ray version; both by Michael Cookson), is a truly spectacular accomplishment by an orchestra and conductor at the top of their games. I am especially enthusiastic about Nelsons’ gift for contrast: his largo is idyllic, almost tranquilly slow, but as soon as its last bars fade away, the scherzo erupts with furious energy. The other recordings being reviewed here all have fairly fast scherzos, but Nelsons is fastest of all. His finale, too, is perfectly judged, with careful rubato and a clarinet solo that, at the 2:20 mark, takes my breath away. The Bavarian strings are noteworthy too. Karel Ančerl’s recording, a performance with the Vienna Symphony, hails from 8-10 February 1958. It sounds every bit as old, or worse. Technicians have cleaned away any tape hiss or popping sounds, but the recording is still in seriously constricted mono; an exception: there is still some tape “noise” at the start of the finale. Woodwind colors come through clearly, but the bass sounds the way Toscanini’s bass did in the 1940s on NBC. It’s a quick, businesslike performance, with Ančerl sticking strictly to tempos. The result may actually please you; I do like the lack of nostalgia about this performance. It speaks with angry, storming urgency. Remarkably, Ančerl’s account gets even more compelling as it goes along. That includes the slow movement, probably the fastest I have ever heard from anybody at a mere 9:46. I don’t know how it’s only 9:46. It never feels fast; Ticciati’s account feels fast, but it’s two minutes slower. The playing is impassioned; phrases and melodies breathe naturally. There’s a much better-sounding Ančerl recording with the Czech Philharmonic on Supraphon, but this is an achievement too. As for couplings: Ticciati offers a gentle, relaxed version of the American Suite; Morlot opts for the unusual (but in a way logical) coupling of Varese’s Amériques; Nelsons delivers a crackerjack and maybe best-ever reading of the truly rare late Dvořák piece A Hero’s Song; Ančerl has Smetana’s Moldau; and Jaap van Zweden offers absolutely nothing at all. I should take a moment to cite Morlot, in particular; Amériques gets a total knockout of a performance, to the point where you wonder if Dvořák is the “filler.” Former MusicWeb International contributor Bruce Hodges told me — and I hope he doesn’t mind my quoting him — that “The percussion is especially interesting; I don’t think I’ve ever heard a siren used as expressively as it is here.” It’s a pity that van Zweden’s performance, as good as it is, comes on an album all by itself. My recommendations? You can probably skip Ticciati, Morlot, and Ančerl, but the performances are all enjoyable, so buying them is not necessarily a mistake. It’s well worth investigating Morlot’s Amériques separately, as, say, a lossless download from eClassical. Speaking of eClassical, that’s the ideal place to acquire the Jaap van Zweden recording, since eClassical charges by the minute rather than charging a flat fee for every album. At places like iTunes, this recording is simply not a good deal. Which leaves the best of the new bunch: Andris Nelsons and the Bavarian Radio Symphony. This is one of the best recordings of the Dvořák Ninth in many, many years. Not happy with the current crop? You only need wait another month. By fall, we’ll have a period-instrument account from Anima Eterna and Jos van Immerseel. This symphony is, seemingly, even more popular than ever.